Though a couple isolated showers may develop over the eastern FLX this afternoon, the weather will be much quieter on Tuesday than it was on Monday. Cold air invades the region tonight with well below normal temperatures. After an active afternoon and evening on Monday, the weather will be much calmer on Tuesday as a cold front approaches. This front will not make it through the region until this evening, so Tuesday should end up being fairly pleasant still, with most areas reaching into the 70s. By this evening though, the cooler air will begin to work in, with temperatures dropping into the 50s by 8pm. Morning lows Wednesday will be in the low 40s with a few spots even reaching the upper 30s in the western Southern Tier. Precipitation will be much harder to come by today, with the prime area for shower and thunderstorm development over eastern New York. Still, a few showers may still pop up this afternoon, especially as one goes further east. 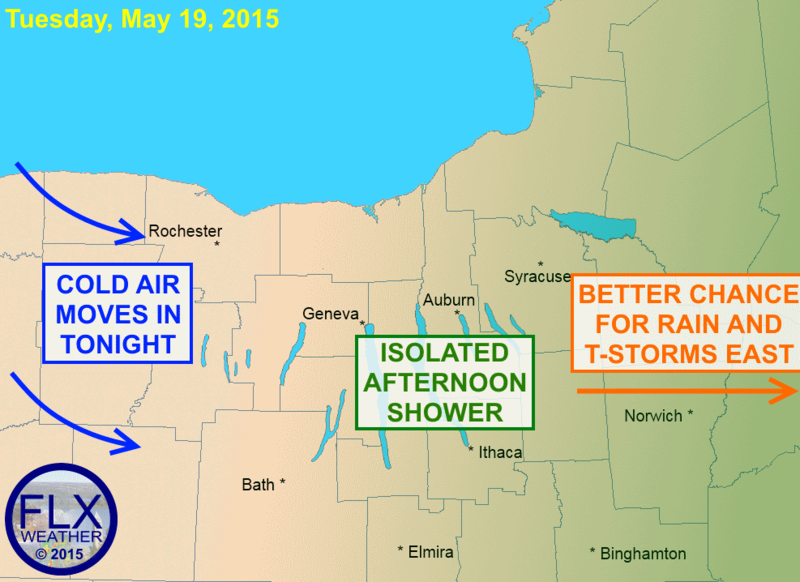 From roughly Seneca Lake west, there is little chance of any substantial showers. Temperatures on Wednesday will struggle to get into the low 50s for most of the region- another drop of 30º or more compared to Monday’s high temperatures.